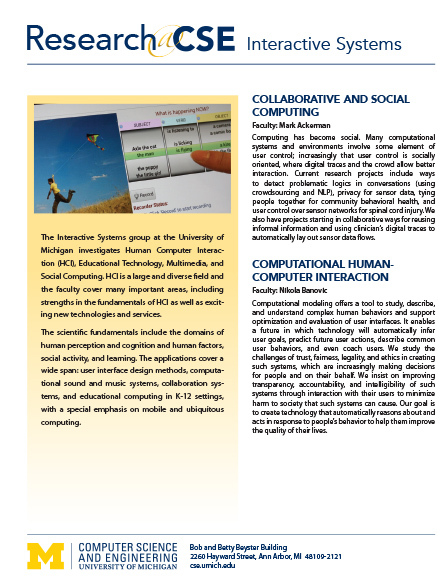 The Interactive Systems (IS) group at the University of Michigan investigates Human Computer Interaction (HCI), Educational Technology, Multimedia, and Social Computing. HCI is a large and diverse field and the faculty cover many important areas, including strengths in the fundamentals of HCI as well as exciting new technologies and services. The scientific fundamentals include the domains of human perception and cognition and human factors, social activity, and learning. The applications cover a wide span: user interface design methods, computational sound and music systems, collaborative systems, access technology, and educational computing in K-12 settings, with a special emphasis on mobile and ubiquitous computing. Some research projects include cognitive models, educational software for handhelds, immersive audio displays, singer identification and vocal pedagogy, audio representations and metadata extractions, studies of privacy in pervasive environments, collaborative recommenders, and multi-person awareness in pervasive environments. This website is a good source of information if you are interested in pursuing graduate studies in HCI, educational technology, multimedia, social computing, or related areas. To apply for our graduate program in CSE, please visit our prospective student page on the CSE website.